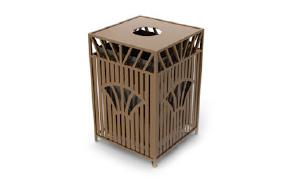 The distinctive sunrise series trash can with its curves and angles has a charming style that will enhance any indoor and outdoor setting. Solid steel construction and powder-coated finish will provide many years of service. Comes standard with a 32 gallon rigid plastic liner. Flat Top Lid with Round Opening. 32 Gallon Rigid Plastic Liner. Available in an Array of Colors.